Size of this PNG preview of this SVG file: 600 × 600 پکسلز. دوجے ریزولوشنز: 240 × 240 پکسلز | 480 × 480 پکسلز | 768 × 768 پکسلز | 1,024 × 1,024 پکسلز | 889 × 889 پکسلز. 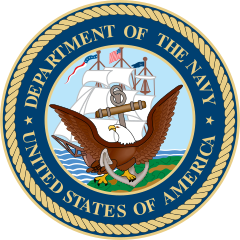 English: Seal of the United States Department of the Navy. The US Navy Seal in two colors; Reflex blue and white. The US Navy Seal in Black & White.